The Typing of the Dead: Overkill just got a whole lot classier (and multiplayer, too). The Typing of the Dead: Overkill is kind of an unexpected take on the original, turning a "learning is fun!" 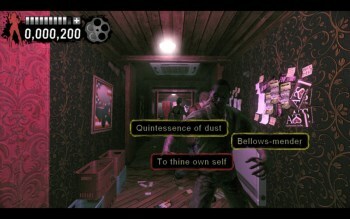 type of game into an F-bomb-laden homage to grindhouse horror flicks. A little strange, perhaps, but not nearly as flat-out weird as the new Shakespeare DLC, which injects a healthy dose of the Bard into your zombie-slaying keyboard action. "Bellows-mender!" you'll type in a desperate attempt to escape the withered clutches of the undead. "Seek the beauteous eye of Heaven!" Yeah, I don't get it either. On a (slightly) more serious note, the DLC should add a new level of challenge to the game, since players will be forced to type a lot of unusual, and presumably unfamiliar, words. Sega said this is the first of "many planned lexicon packs." The Shakespeare DLC is available now on Steam for $2.99. A separate, free update to The Typing of the Dead: Overkill will add a two-player co-operative multiplayer mode to the game is also in the pipe and may well be available by the time you read this. Forsooth!